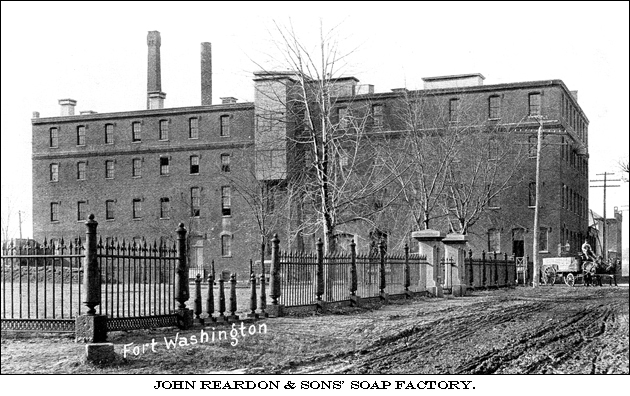 In 1856, John Reardon formed a company in Cambridgeport dedicated to the manufacture of candles and soaps. With the admittance of Reardon’s sons to the firm in 1863, the firm name was permanently changed to John Reardon & Sons Company. With the decline of candle use in New England in the late nineteenth century, the business began to specialize particularly in the exportation of tallow and the production of oleomargarine, butter, and oil. Other production interests included laundry and toiletry soaps. In 1878, the company moved to a larger factory in the area around Fort Washington and began additionally manufacturing glycerin and high-grade fertilizer. At its height, the firm employed 150 workers and produced over ten million pounds of processed goods per year (Gilman, 1896).